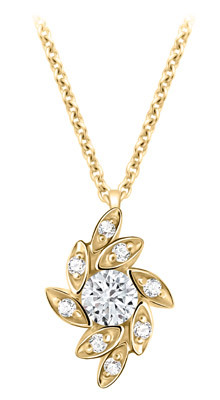 This unique 14k yellow gold leaf pendant has one 0.35ct diamond in the center and eight .015 ct diamonds in the leaves. The pendant comes on a 1.1 mm yellow gold cable chain. Part of our new designer line, this necklace has a matching ring.